Thousands of people in Hong Kong are protesting a decision by China’s top legislative committee that voters would be able to choose only from a list of pre-approved candidates for the office of Chief Executive of Hong Kong. This decision, which came down in August of 2014, is a way in which the Chinese government can fulfill its promise to Hong Kong to have direct elections for Chief Executive by 2017, while controlling who is eligible to be elected through the new system of universal suffrage. The promise to have universal suffrage in Hong Kong stems from a 1984 agreement between China and Great Britain, in which Great Britain restored Hong Kong to China. This agreement promised Hong Kong a high degree of autonomy. Hong Kong’s leader, the chief executive, is currently elected by a 1,200 member election committee, which many view as pro-Beijing. The Chinese government decision to vet the candidates for chief executive is what sparked the protests in Hong Kong. Two main groups lead the protests, which began in late September of this year. Occupy Central was founded by moderate pro-democracy activists and is insisting the Chinese government not assess and pre-approve candidates for election in 2017. The other main organizer of the protests is the Hong Kong Federation of Students, which initially boycotted classes, but is now protesting at sites throughout Hong Kong. Protestors believe that the Chinese government will use the vetting process to weed out any nominees who are not pro-Beijing. In a call for true democracy and genuine universal suffrage, the protestors have assembled in the streets of Hong Kong to pressure the government to make a change. 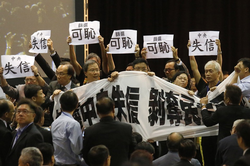 Pro-democracy lawmakers hold up a banner and placards to protest as the deputy general secretary of the National People’s Congress of China speaks during a brief session in Hong Kong. Photo and Caption Credit: Bobby Yip/ Reuters, http://www.wsj.com/articles/photos-hong-kong-election-decision-prompts-protests-1409515247. The groups leading the protests have advocated for non- violent campaigns in the streets of Hong Kong. Street protests soon led to the students of the Hong Kong Federation of Students threating to occupy government buildings if the current Hong Kong Chief Executive CY Leung did not resign. In recent days, the protests have been mired in violence. On Saturday, October 18, protestors reclaimed a site that had been previously cleared by the Hong Kong police, sparking violent clashes with police using pepper spray and batons to gain control of the crowd. Pictures and video have surfaced of police officers, who are now on temporary leave, beating protestors. These photos have surfaced in the midst of increasingly violent altercations between police and protestors, including the use of riot shields and tear gas to disperse crowds. The next step for the protestors advocating for a genuine direct election process will happen on Tuesday October 21st. Hong Kong Chief Executive, CY Leung, has set up talks with the Hong Kong Federation of Students but it is said that these talks will not address the core issue of genuine universal suffrage in 2017. Instead, these talk will focus on the recent violent clashes with local police. While the upcoming talks between protestors and Hong Kong officials may not cover the key issues, they are a step forward for the protestors. In a time when violence is growing, dialogue between protestors and officials is increasingly important. The people of Hong Kong fighting for genuine democracy must continue to fight in a non-violent manner, to take the higher road. They are gaining the support of the international community and their movement will only be bolstered by a peaceful civil protest that delivers a message unblemished by violence. Julie Marling is a 2L at the University of Denver Sturm College of Law and is a staff editor for the Denver Journal of International Law and Policy.